In the second chapter of 'Cyprian of Antioch: A Mage of Many Faces' we discover a 4th century source document that previously had not been translated into English. This is the 'Oratio Cypriana' or also called 'The Ancient Prayer of Cyprian'. We find versions of it in Greek, Arabic and Ethiopian languages, and its widespread propagation is testament to the influence and social appeal of our magical Saint across the old world so close to his own lifetime. The essence of this special and little known magical text is a mighty conjuration of the creative forces of life, performed in the first person voice of Cyprian himself. 310 pages, full color. Standard hardcover and full-leather Deluxe Editions available now. 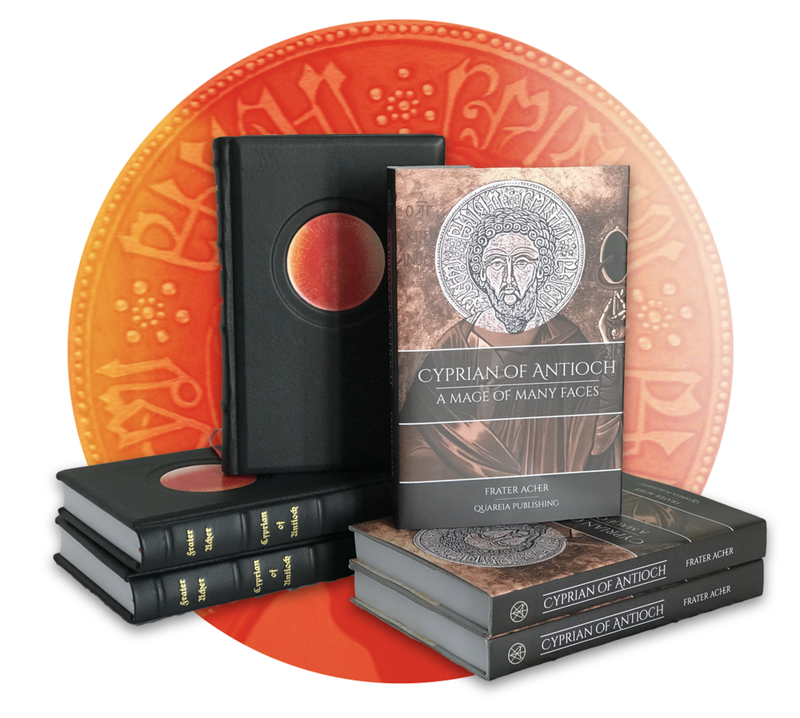 Studying this long orison in detail comes with important insights not only as to how how magic in the 4th century had been worked, but maybe more importantly as to what the specific powers had been attributed to Cyprian of Antioch at this early stage of the Cyprianic tradition. In the book we provide a detailed analysis of this prayer over almost forty pages: Each paragraph is first translated into English and then heavily annotated and explained. The goal of the entire chapter being to empower modern day magicians to leverage this ancient text for their own practice again. In order to support this goal even further and in an exclusive partnership with the wonderful Marissa Newell of 'Veil of Earth' we are proud to present an original, new magical artefact - combining a section of this ancient conjuration with Mrs.Newell exceptional skills in traditional pottery. 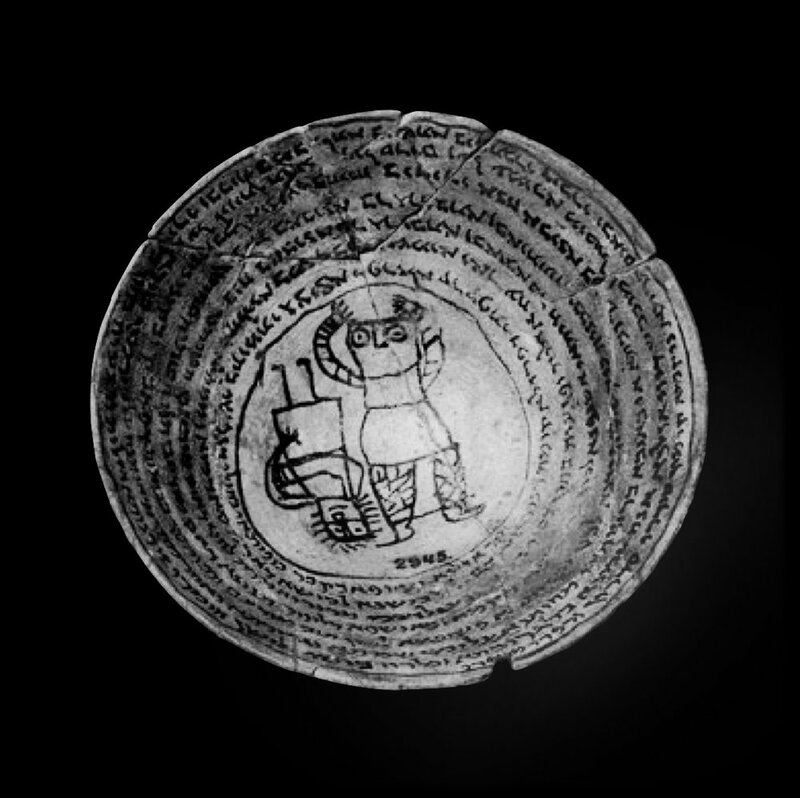 Incantation bowls are magical devices that first appear shortly after the lifetime of Cyprian of Antioch, in the fifth century across ancient Mesopotamia and modern day Iran. 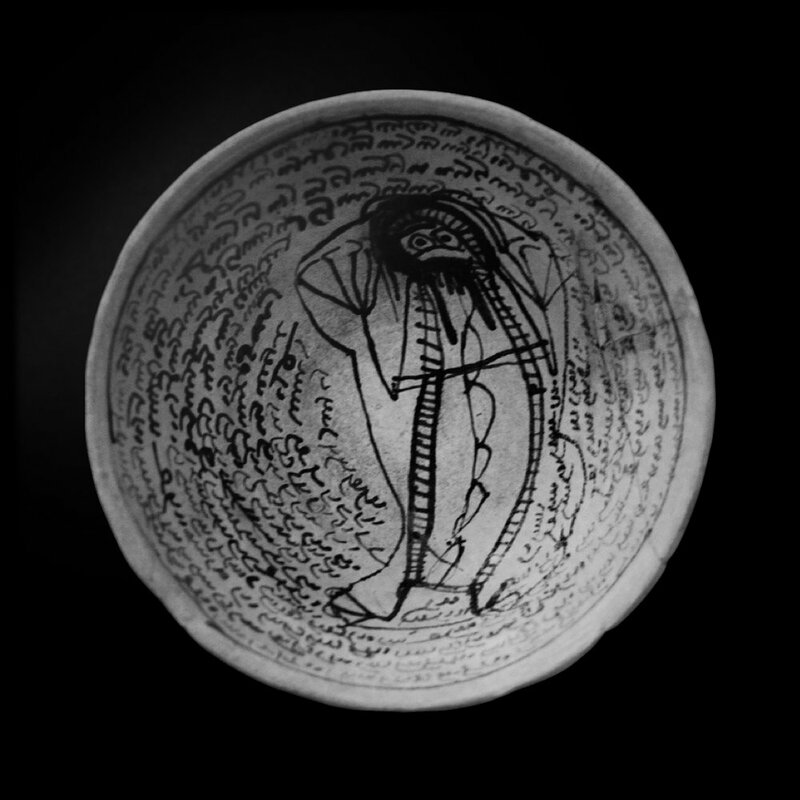 These are bowls made of clay, inscribed with ink on the inside with long conjurations, mostly in Aramaic language and the text spiralling down from the rim to the centre where often the image of the related demon is depicted. The traditional use was to bury these bowls upside down under the four corners of a house or the threshold of a door - attempting to vanquish evil demons and to banish them from entering the house. 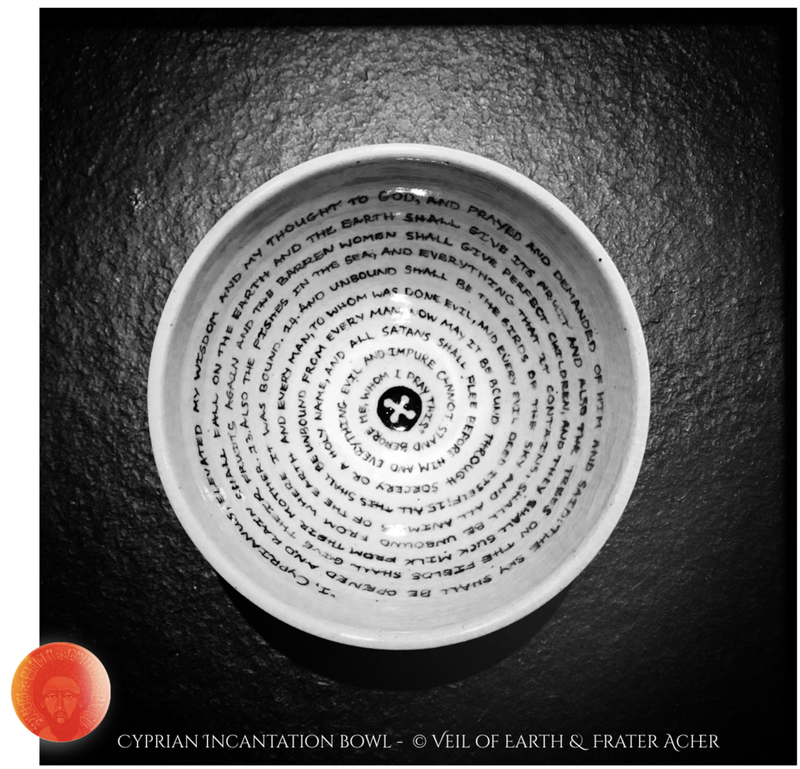 For this new interpretation of an incantation bowl we suggest to alter its use slightly. Rather than burying it, we suggest to apply it to simple everyday use. By drinking water, coffee or wine from it, by offering herbs, fruits or nuts in it we bring the substance of our food in direct contact with this ancient conjuration written in the first person of Cyprian of Antioch. 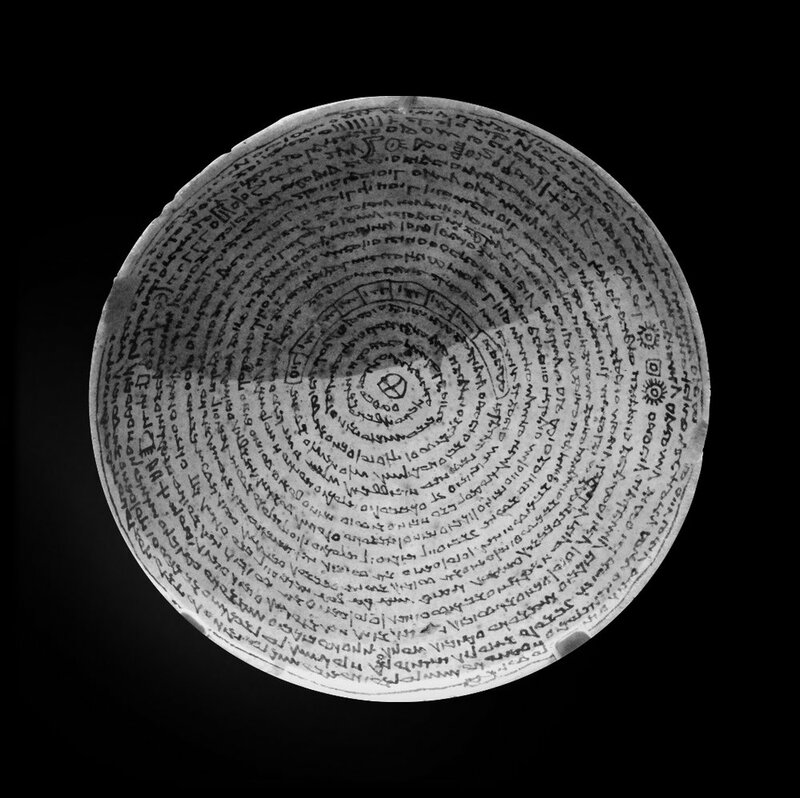 Whether we choose to drink from it ourselves or to offer its content to the spirits, this incantation bowl allows us to 'bring text to life' in an entirely ancient and yet incredibly practical way. 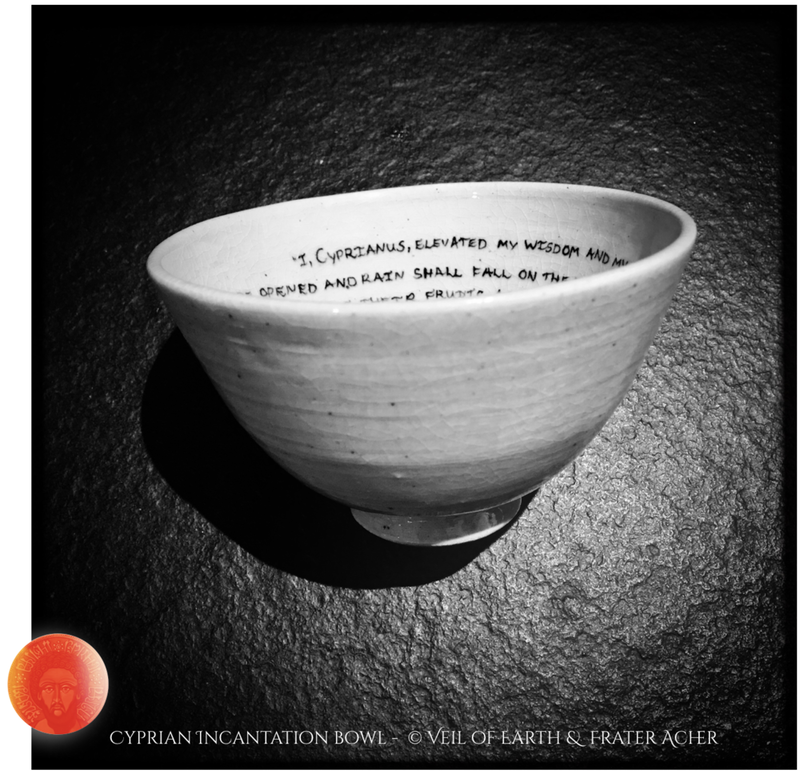 Such active use of incantation bowls actually presents an ancient precursor of modern day Sigil Magic: putting these magical objects to everyday use allows us to 'make the word flesh' as Austin Osman Spare said. 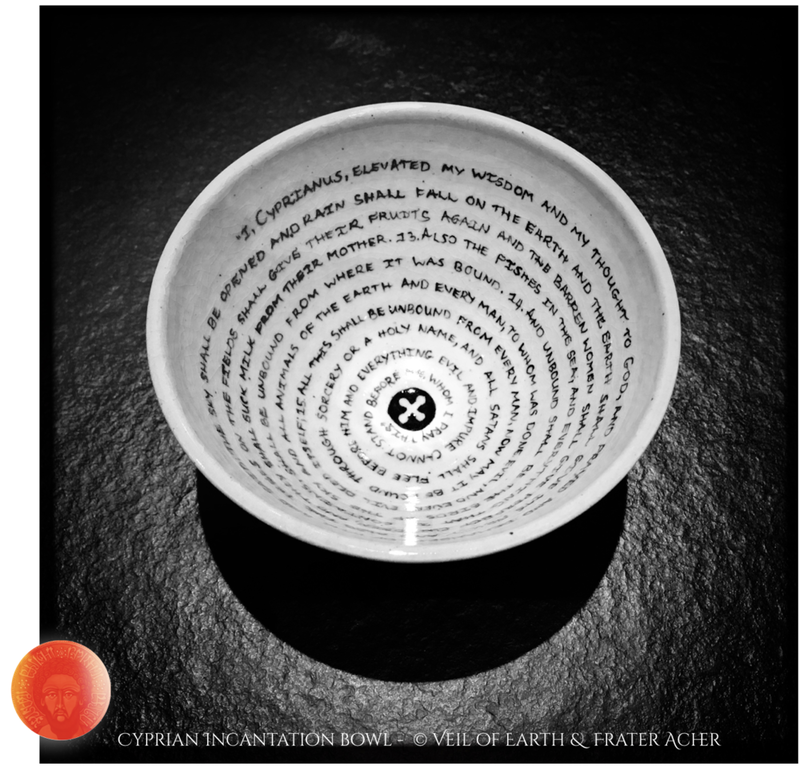 No different than the old folk-practices of putting a magical book under your bed or pillow, so does the incantation bowl overcome the ;labyrinth of our rational mind - and creates a direct physical bond between our bodies and the words of Cyprian. Drinking directly from it is a way of bringing the written word into life, to 'make it flesh' that can access our subconscious without needing to pass through our rational minds first. It is a straight forward and yet powerful form of magic that for too long has been forgotten. Partly this might have been because of the exceptional skills it takes to create an incantation bowl. When I received my own set of three a few weeks back and unpacked them, I was not only struck by their harmony of form and design, but I felt them singing with magic. They were literally speaking to me without even doing anything from my end... To create such an object takes incredible craftsmanship: the design and throwing of the perfect shape of the bowl, the glazing, and possibly most of all the intricate inscription in beautiful hand-writing of the long section taken from 'Oratio Cyprian'. I have looked at the bowls every morning since, drank my strong morning coffee from them - and am still in love with them. 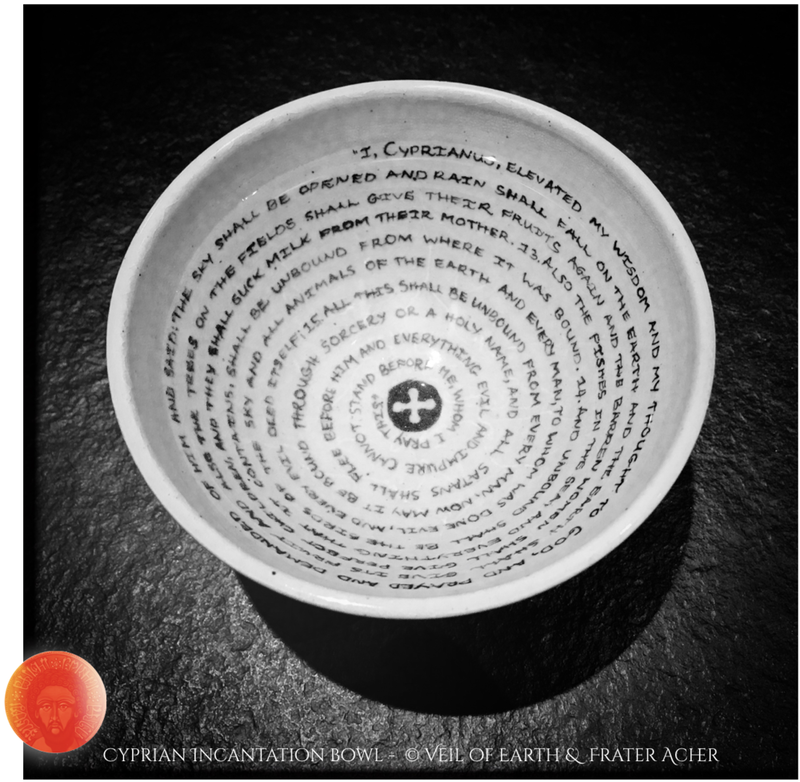 Every morning I look at the words of Cyprian as they reveal themselves when I drink from one of the bowls; I look at the spiralling text when I wash it with water, and I look at it while the bowls wait on the shelf to be refilled again. Thank you, Marissa for dedicating your craft to this. And thank you, Cyprian of Antioch for blessing us with this wonderful conjuration from so many centuries ago. 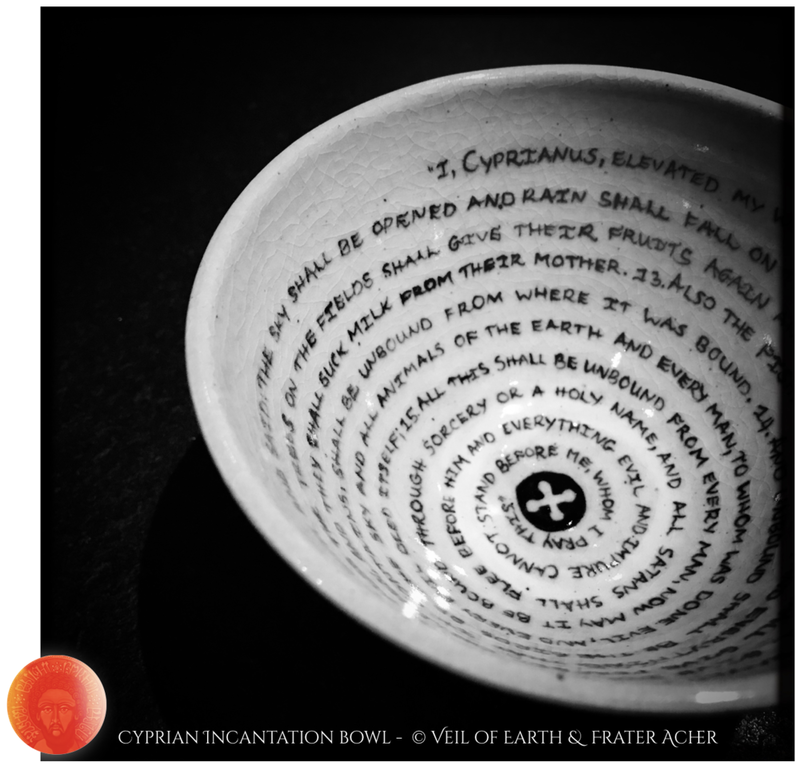 Below you can see some further images of Cyprian's incantation bowl, as well as the excerpt of the 'Oratio Cypriana' used in their design.